Epic is the industry's largest air-cooled reflector! Features our exclusive 98% reflective Silver German aluminum for unmatched reflectivity. Restrike panel is 95% reflective textured German aluminum. Completely sealed using double gaskets (between glass & reflector and glass & frame). Swing Stop retention cable keeps glass from abruptly swinging down. Bolstered sealing points to ensure tight air-cooled integrity. Built in 8 inch air cooling ducts with bead ring to hold ducting securely in place. Integrated socket and new detachable 15 ft lamp cord. Durable powder coated galvanized steel housing. Comes with a Sun System level for easy, consistent, level hanging. Captured thumb screws & closure mechanism an air-tight seal. 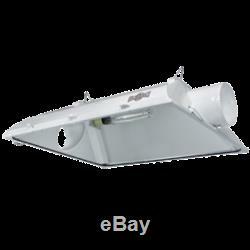 The item "Sun System Epic 8 Air-Cooled Grow Light Reflector" is in sale since Wednesday, January 30, 2019. This item is in the category "Home & Garden\Yard, Garden & Outdoor Living\Gardening Supplies\Hydroponics & Seed Starting\Grow Light Kits". The seller is "customcarfool5150" and is located in Riverside, California. This item can be shipped to United States, Canada, United Kingdom, Denmark, Romania, Slovakia, Bulgaria, Czech republic, Finland, Hungary, Latvia, Lithuania, Malta, Estonia, Australia, Greece, Portugal, Cyprus, Slovenia, Japan, China, Sweden, South Korea, Indonesia, Taiwan, South africa, Thailand, Belgium, France, Hong Kong, Ireland, Netherlands, Poland, Spain, Italy, Germany, Austria, Bahamas, Israel, Mexico, New Zealand, Philippines, Singapore, Switzerland, Norway, Saudi arabia, Ukraine, United arab emirates, Qatar, Kuwait, Bahrain, Croatia, Malaysia, Brazil, Chile, Colombia, Costa rica, Panama, Trinidad and tobago, Guatemala, Honduras, Jamaica, Viet nam.